How to Increase Brush Size in Flash CS6? I Recently started learning Flash and due to my nature of looking at wrong places, I was unable to figure out how to increase the size or stroke size of my brush. Well, this is not my fault Completely. Adobe Guys have made it a little confusing for beginners as well. For Example, When you click on the Brush Tool from the Toolbar, this thing shows up on your right. The Stroke Slider is Frozen and one can not change its value. This is really irritating. But, this is not what we are looking for. To Change the Brush size Look at the bottom of toolbar. 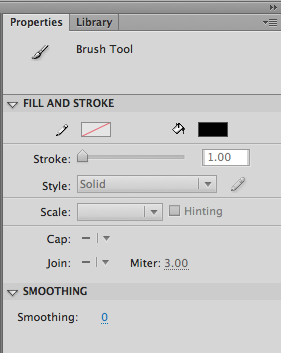 The last two options are ‘Brush Size’ & ‘Brush Shape’. Here, you can select the desired Brush Size and Shape. 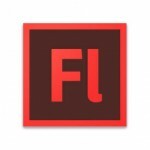 Flash CS6 has limited the Maximum Brush Size, and you can not change it beyond an extent. But, I hope you found what you were looking for. Posted on January 13, 2013 by Rohit Tripathi. This entry was posted in Flash. Bookmark the permalink. But why are most of the brush properties disabled in the first place? That is something which can only be answered by Adobe Guys. this helps me a lot. Thanks! Thank you so much. I’ve been trying to teach myself to use flash and I’ve only found bumps in the road so far. So this little thing you wrote here was amazing. Thank you!! Pick the shape of the brush you want and choose the largest size allowed. Now use the drop down menu that sets the size view of the stage to reduce the stage from 100% to an amount that you want to correspond to the increase in brush size. For example: reduce your stage from 100% to 25% to make your “effective” brush 4 times larger. Reduce your stage from 100% to 10% to make it 10 times larger. The size of the brush will not change no matter how small the stage you work on.